Nissan Motor Co., Ltd. announced that the 100 per cent electric commercial vehicle, the 'e-NV200', will arrive in the Japanese market during fiscal year 2014, and will eventually be sold worldwide. following the world's best-selling EV, the Nissan Leaf. Production of the e-NV200 model will begin at Nissan's plant in Barcelona, Spain in mid-2014. In addition to offering the same interior spaciousness, utility and practicality of conventional vans, the e-NV200 produces zero CO2 emissions during operation. The vehicle also provides functions that extend business potential in numerous situations. These include the power supply function in the luggage area for outdoor activities or emergency power, and the advanced telematics system. 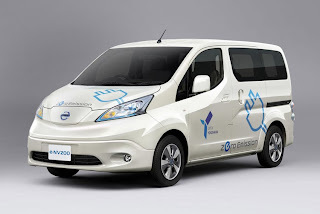 In order to establish an effective model case that leverages the characteristics of e-NV200, Nissan is discussing specific strategies with the government of the company's hometown, the city of Yokohama. Under consideration are the use of e-NV200 by Yokohama city for its public services vehicles and the establishment of a vehicle monitor user program, which would be available to all city residents. Nissan and the city of Yokohama are already collaborating on the 'Yokohama Mobility Project Zero', an effort to realize the next generation in traffic, with a goal of achieving a city with a low carbon footprint. Activities so far have included the use of Nissan Leaf and the Nissan New Mobility Concept, an ultra-compact electric vehicle. The parties may expand the project with the introduction of e-NV200. Measures to utilize the e-NV200 are evolving in Barcelona, Spain, which is involved in a mutually cooperative arrangement with Yokohama city in the formation and development of smart cities. Plans are being made to use the e-NV200 for smart transportation in Barcelona, such as for taxis. Along with this, preparations are in process to install a quick charger network and dedicated EV parking areas to support the taxis. In addition to solidifying Nissan's zero-emissions leadership position, the 100 per cent electric commercial vehicle e-NV200 is a model that brings great innovation to the commercial vehicle market. Based on the NV200, which was selected as the next-generation taxi in New York City, the e-NV200 offers excellent acceleration and quiet operation, all made possible by the highly evaluated powertrain of the Nissan Leaf. As well, e-NV200 has the lowest operating costs in the commercial vehicle segment, an important consideration for businesses.